City Theatrical has announced some great new additions to its product line of low voltage dimmers and some changes to the existing low voltage dimmers. D2 Dimmer A tiny (the size of a credit card and 1/2” thick) two channel dimmer with a capacity of 5A per channel. Great for props and costumes. D2 SHoW DMX Neo Dimmer A tiny two channel dimmer with a with a capacity of 5A per channel and a built in SHoW DMX Neo Receiver. D3 Dimmer A three channel dimmer that can be configured as three 10A, two 15A, or a single 30A dimmer, with a user friendly interface and stand alone modes. D4 Dimmer A tiny (the size of a credit card and 1/2” thick) four channel dimmer with a total capacity of 10A. 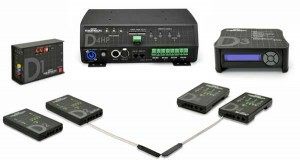 D4 SHoW DMX Neo Dimmer A tiny four channel dimmer with a total capacity of 10A and a built in SHoW DMX Receiver. These products are designed and built by City Theatrical and are the products lighting professionals demand for live theatrical productions, television shows, motion pictures, music tours, and other productions. These are feature rich products with a lot of set up and operation choices to make installation and operation easier. All of City Theatrical’s low voltage dimmers feature ultra-smooth dimming curves, especially at the very low end. City Theatrical has a wide range of dimmers for all uses, from tiny dimmers that can be concealed in costumes and props, to high capacity dimmers with built in power supplies to make large installations easy.